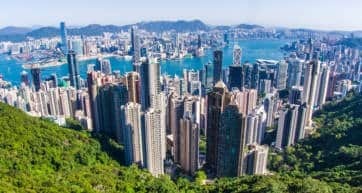 Stretching all the way along the coast from east to west, the sprawling Southern District of Hong Kong has an almost riviera-like atmosphere, with beautiful beaches, dragon boat races, yacht clubs, and country parks. ‘Southside’ feels a million miles away from the chaotic crowds of Central, but is still easily accessible by bus and MTR. 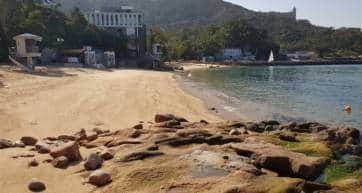 The eastern side around Stanley and Shek O remain less developed and so far has no MTR access, but in such a fast-paced place, it’s only a matter of time. Stanley is a great day trip and a very scenic ride over the winding mountain roads from Central. 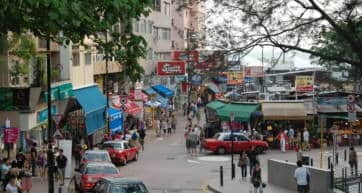 The top attraction in this pretty seaside town is Stanley Market, a nice bazaar selling the same knick-knacks and Oriental souvenirs as Ladies’ Market or Temple Street, but without the crowds. There’s a beautiful beach, a promenade, a scenic pier, as well as a number of al fresco restaurants and bars to enjoy a meal with a view. 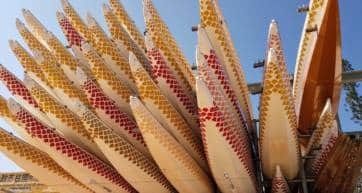 Every year one of the biggest Dragon Boat Festivals is held in Stanley Main Beach, attracting some 30,000 visitors, but for the rest of the year it remains a quiet, charming town. Although Disneyland is famous worldwide, Ocean Park still remains Hong Kong’s most beloved, and proudly local, amusement park. And rightfully so—it has an awesome cable car with ocean views, thrill rides that make adults scream, an impressive aquarium, and everyone’s favorite, the pandas. Ocean Park also hosts events such as jazz festivals and live music, which often gives you free access to the park. Nearby in Aberdeen is the garish but iconic Jumbo Kingdom, with two massive floating restaurants that over the decades have hosted the likes of Queen Elizabeth II, Tom Cruise, and David Bowie. Decorated like a Chinese imperial palace, it has been featured in a number of international movies. Visitors cross the bay by taking a ‘sampan’ boat, free of charge, to the Kingdom. Yes, it’s a tourist trap, but it’s still a sight to behold. Some of Hong Kong’s best beaches are located in the south side. Repulse Bay is an upscale residential area with restaurants and bars on a gorgeous beach, which makes it a popular spot on the weekends. Less crowded are Middle Bay Beach, Deep Water Bay Beach, and Chung Hom Kok Beach, but there are many more to choose from. 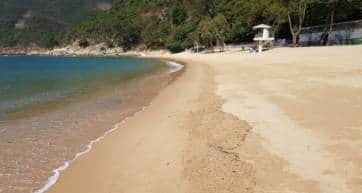 If you want the place all to yourself, go more east to Shek O, a beautiful peninsula with a country park and two remote beaches—Big Wave Bay Beach, which attracts surfers, and Shek O Beach, which also has a quaint village. Shek O is home to one of Hong Kong’s most stunning hikes, The Dragon’s Back. Many visitors ‘conquer the dragon’ in the morning, and then spend the afternoon relaxing on the beach. Stanley has many restaurants, but for a meal right on the water, look for The Boathouse, a blue three-story traditional building overlooking the bay. Next door is The Pickled Pelican serving up British style pub food, and Seafront, with its Greek atmosphere. Inside the colonial-era Murray House you’ll find King Ludwig Beerhall, a Bavarian bar with German cuisine. Repulse Bay has a new waterfront complex, The Pulse, with a wide range of al fresco dining. Cabana, however, offers private cabins facing the sea, Japanese baths, and an open-air lounge. There’s also Balinese-style TRi, the Fratelli pasta bar, and trendy coffee shop Classified, to name a few. The Sunset Beach Club is an open-access rooftop area, which invites people to enjoy the ‘free sunset, free sea view, and free open air’ which is a rarity in Hong Kong. To step back in colonial time, visit The Verandah at the Repulse Bay Hotel, and be sure to order the Pimms, a timeless classic. Over in Shek O, things are a lot more laid back. Cococabana has a prime spot on the beach, right next to the lifeguard towers, but for something a bit more low-key visit Ben’s Back Beach Bar, a long-time favorite of resident-expats. 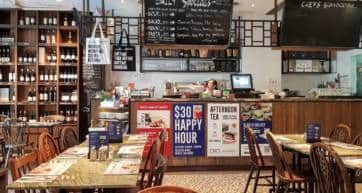 Venture into Shek O Village and you’ll find a lot of choices, including Happy Garden and Shek O Thai, both serving Thai food, and small local Cantonese eateries, like Lu Lu Shop. 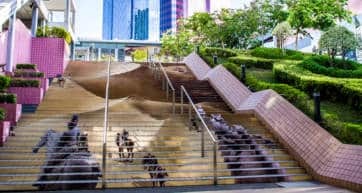 Though most visitors choose to stay closer to the action around Central, or on the ‘other side’ in Kowloon, the southside is a nice place to stay a night or two, if you have time and want to explore. The Stanley Oriental Hotel has a beautiful spot overlooking the bay, and is right by Stanley Market, making it an excellent base for exploring the town, and going out at night to the nearby restaurants and bars. If you’re visiting Ocean Park, check in to the brand new The Hong Kong Ocean Park Marriott Hotel, which opened at the end of 2018. Ovolo Southside and L’hotel Island South are two other good choices, being clean, modern, and right by Ocean Park. Travelling in a group? Then forget the hotels and instead split the cost for a little taste of luxury. For a truly unique experience, spend the night on a house boat berthed in the Aberdeen Marina. There’s nothing quite like waking up on a gorgeous boat, and sipping coffee on the open air deck, with views of Aberdeen Harbour.